Google’s search results suggests millions or billions of web pages, depending on what you type in. The competition to rank first is fierce, especially when the rules of what ranks high are constantly changed. Google has launched major updates over the past couple of years that had a significant impact on ranking. One strategy that still works as well as ever is content marketing. 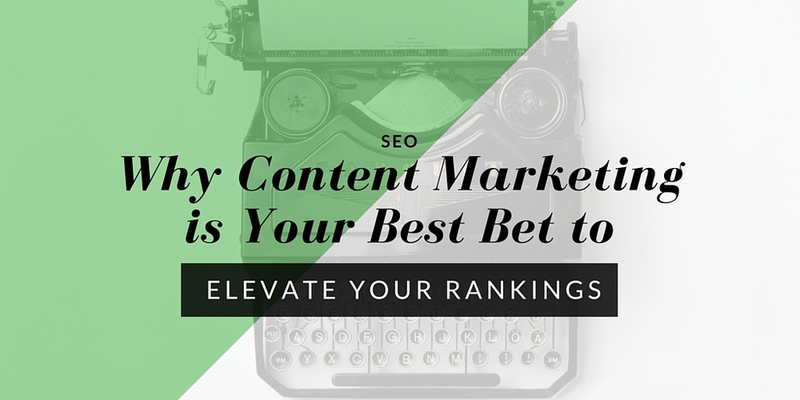 Here are five reasons why content marketing is your best bet to elevate your rankings. One of the biggest factors in SEO is keyword density. Professional copywriters specialize in strategically placing keywords in the texts of websites but there is a limit to how long pages should be and how often the keyword should be included. If those limits are exceeded, the keyword becomes too repetitive (also known as the sniper issue) and also the length of a web page should only be as long as needed. One easy way to strategically include keywords and rank higher is to use content marketing. It systematically targets keywords and you have the opportunity to convince the reader to convert. The maximum recommended keyword density at the moment is at around 4.5% and industry standards recommend unique content. Google loves long page visits and engagement such as shares and comments. Content marketing is one of the easiest ways to get just that because you can provide solutions to problems that people google. Having a problem usually comes with a certain sense of urgency to solve it. Therefore, people are much more likely to click on your article and browse longer until they find the right answer. Additionally, they may share the solution with one of their team members or leave a comment with a question which Google then counts as engagement. Long guides are frequently bookmarked and get long page visits which benefits rankings as well. SEO needs backlinks. Instead of outsourcing backlinks and potentially harming rankings every time Google launches a major SEO update, publish your own unique content. Good content generates backlinks to your site because bloggers and writers need sources for their articles. Include quotes and stats in your articles to increase the chances of getting backlinks. Additionally, you can also link your own articles to one another. High SEO rankings are not something a website can get overnight. One thing that Google considers to be important is that there is new content published every now and then. Many SEO professionals consider 15 days the maximum a website should go without new content which means that websites should be updated a minimum of 26 times a year. One of the easiest ways to do that is content marketing. New content counts as update and websites benefit from regularly published blog posts, podcasts, videos, and other content formats. Ideally, content marketing covers a mix of hot topics and evergreen content to provide a constant flow of traffic. Current topics are always good to have because there is usually more search volume for the first couple of days. On the other hand side, traffic quickly decreases when the topic is no longer new or relevant. Evergreen content compensates for that because it will always be a great contender for retweets, shares, and backlinks.